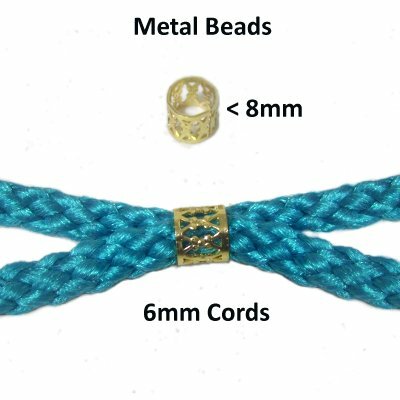 The Macrame Beads described on this page are commonly used for Macrame projects made with 3mm to 8mm materials. There are also tips about sizing, preparation, and techniques. The most important feature to focus on when purchasing beads for Macrame is the hole size. You also need to consider the width of the material, how many cords pass through the beads, and how flexible the material is. 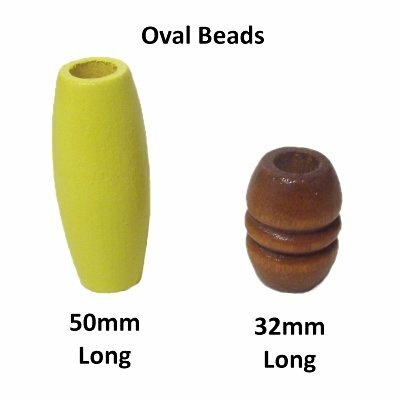 The overall size (length) has an impact on how the beads look in your project. Large, chunky beads on slender cords won't be attractive. You need to find a balance between the bead size and the design of your project. Micro-Macrame Beads are now on a separate page, since they have different features. 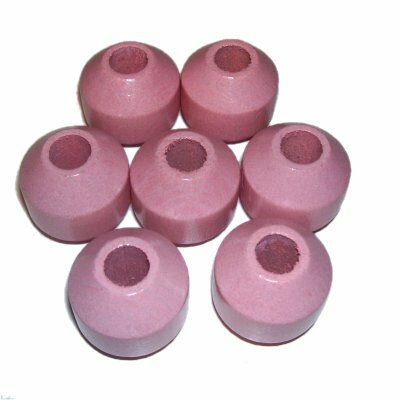 The beads described are used for projects requiring cord 0.75mm to 2mm in size. (Click on the link to visit the page). The most common type of beads used for Macrame are those made with wood. They range in size from 10mm to 50mm in length. The holes are usually 4mm to 12mm in diameter. Beading Tip 1: Remember that cord material is flexible, so it compresses. You can usually get more cords through a bead than you think. Multiply the width of the material X the number of cords passing through the beads. Multiply by 0.5. The result is the minimum hole size required for the number of cords you are using. Keep in mind that inflexible, thick materials require larger holes. You may need to multiply by 0.75 for some types of 6mm material. Example: Four 4mm cords = 16mm. Multiply by 0.5 = 8mm. So 4 cords of 4mm size will usually fit through beads with 8mm holes. 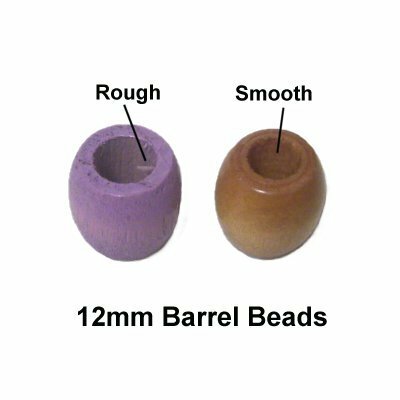 Barrel beads are a great option when making Macrame projects. They are usually 10mm to 12mm long with 4mm or 5mm holes. They are sometimes called "Pony Beads". One 6mm cord can fit through a 5mm hole, making them a great choice for beaded fringe. Beading Tip 2: The INSIDE of all Macrame beads should be as smooth as possible. Before using, clean the interior with a piece of cloth material. Inspect the wood for chips or pieces sticking out from the surface. Sandpaper can be used if the inside is rough. 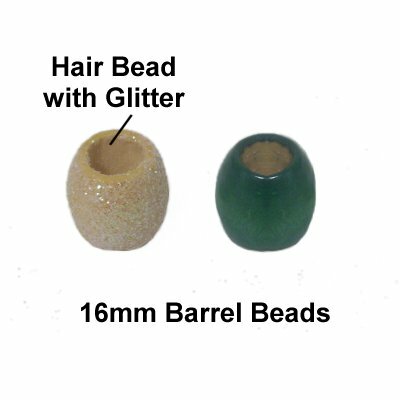 Barrel beads also come 15mm - 16mm sizes. These are sometimes used for hair styles, and can be found with glitter. The hole size is usually 8mm. Round beads come in sizes ranging from 10mm to 38mm. The hole sizes are usually 4mm to 10mm. The Macrame Superstore has several sizes of wood beads. 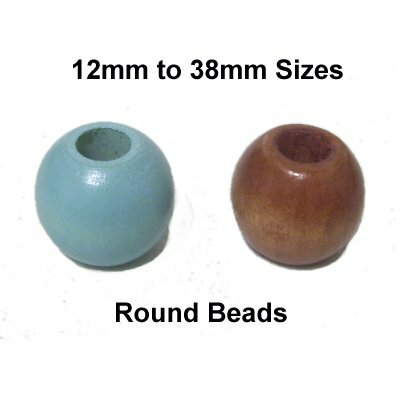 Round beads with average size holes of 8mm are often much larger in overall size than what you would find with other shapes. I've seen big 30mm round beads with tiny holes of 4mm. Beading Tip 3: When purchasing, make sure the hole size is specified in the description, or ask for a measurement. Oval beads are often used in plant hanger patterns. 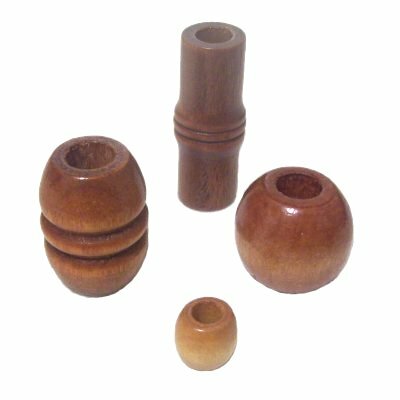 The most common lengths for these Macrame beads are 32mm and 50mm. The hole size is usually 8mm to 10mm. Beading Tip 4: Narrow beads like the ones shown above and below can be a challenge to use on flexible materials. Cotton, for example, is so flexible that long beads are difficult to thread. You may need to stiffen cotton with glue, or apply tape. Beading Tip 5: The best way to apply any bead is to place the tip of the cord into the hole just past the outer surface. TWIST the cord as you push it through. When using multiple cords, pass them through one at a time. 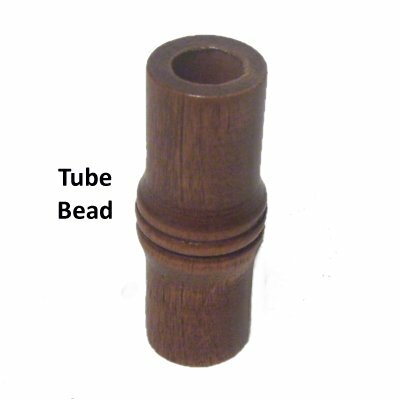 Tube beads are not seen very often in Macrame patterns, but they are a good option. The length is usually over 30mm, with hole sizes of 4mm to 8mm. Beveled beads for Macrame range in size from 30mm to 40mm long. The hole sizes are 8mm to 12mm. Chunky beads, like the ones shown here, look better in designs made with 6mm size cord materials. Unfinished Wood Beads are unique in that you can apply stain or paint to match your project. 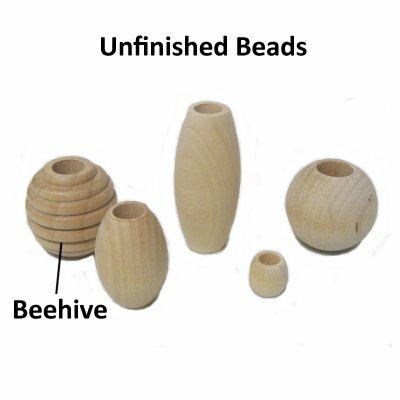 They come in the same shapes and sizes as other Macrame beads, as well as some unusual shapes like the Beehive bead shown here. Blocks can also be used in Macrame projects. Most of ones I've seen were not smooth inside and required sanding. The holes are often 10mm, and can be made larger with sanding. 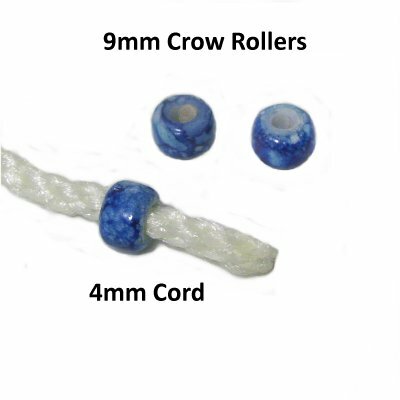 Crow Rollers are often overlooked in favor of other types. The holes are usually large enough for 3mm and 4mm cords to pass through. These 9mm size glass crows are the perfect size for beaded fringe made with 4mm cord material. 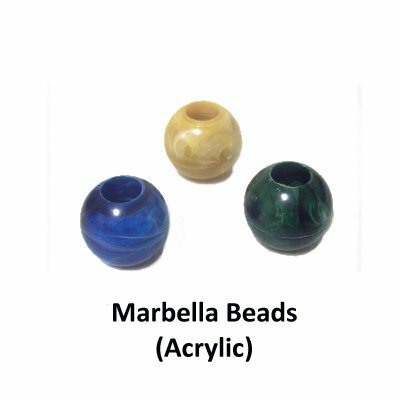 Marbella Beads are made from a type of acrylic material that has swirls resembling marble. 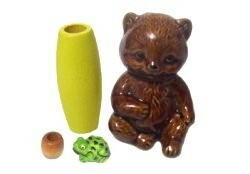 These were frequently made specifically for Macrame in the 1970's, and you can still find them today. The hole size is usually 8mm - 10mm. Ceramic Macrame Beads were also specifically made for this craft. They are hard to find, since they are no longer being manufactured. 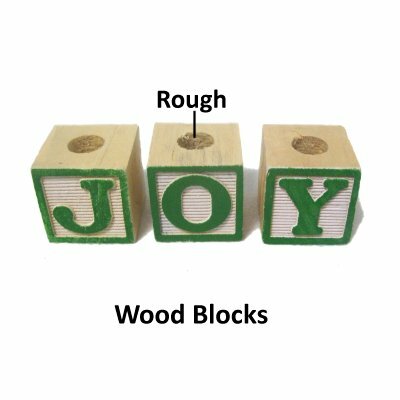 You can find basic shapes as well as figures. The best place to look for them is EBAY. The hole sizes are usually 8mm to 15mm. Metal Beads with large holes are hard to find. The beads shown here are made from very thin brass metal, so the hole size is the same as the overall size (8mm). Two 6mm cords easily passed through, but it was difficult to see them from a distance. 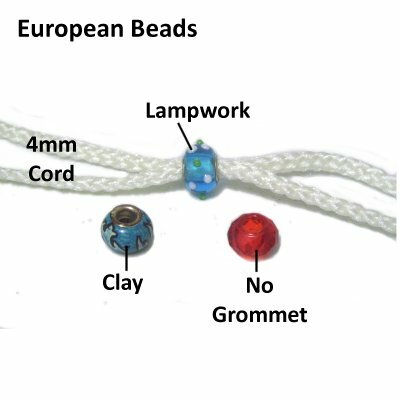 European Beads, sometimes called Pandora beads, have 5mm holes, suitable for 3mm - 4mm material. There is a silver or gold grommet lining the inside of the hole. You can find them without the grommets, too. Most are glass lamp work beads, but you can find clay and gemstone styles as well. 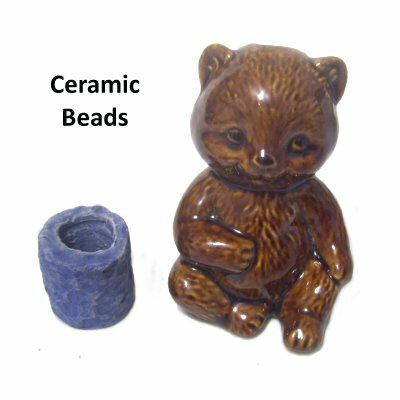 Ceramic Figure Beads sometimes have large holes suitable for 3mm to 4mm materials. 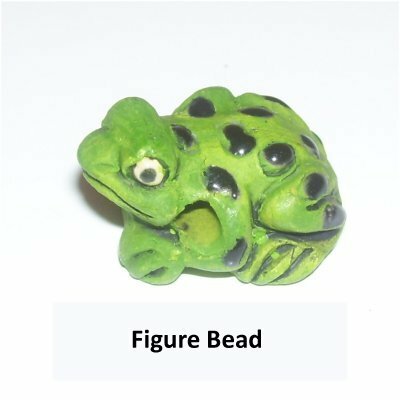 This frog has a hole size of 3mm, which is the average size for this type of bead. 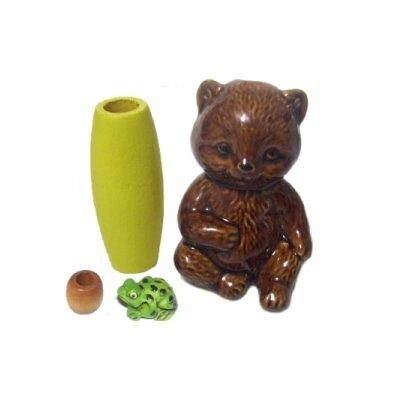 Shipwreck Beads has a great selection of Peruvian ceramic beads (including this frog). Have any comments about these Macrame Beads? Contact Me.